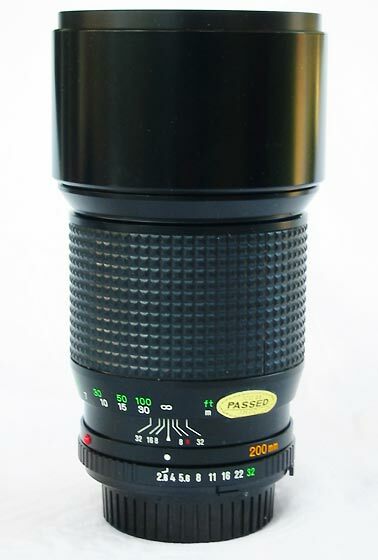 The 200mm f/2.8 - very fast glass for it's era, and still today. Minolta have had a history of making some excellent 200mm lenses, and in September 1979 they enhanced upon this reputation with the release of the magnificent 200mm f/2.8 MD Tele Rokkor (Rokkor-X in USA market). Comprising five elements in five groups, it provided outstanding performance and is one of the most highly sought after Minolta manual focus lenses. After receiving several requests for information on the performance of the lens, I decided to run some testing to see if my good impressions of the performance of the lens from use were backed up by the results of testing. I conducted a first set of tests using Fuji Superia Reala, a fine grained 100 ASA colour negative emulsion. I found upon reviewing the images that performance was excellent at f/2.8, but deteriorated at smaller apertures such as f/5.6 and f/8. This seemed odd to me, and I decided to re-test, to ensure that the softness was not due to camera shake. Despite the camera being on a tripod, the focus calibrated X-570 I use for the tests does not have mirror lock up, and with shutter speeds of between 1/8 sec and 1/30 sec it can experience vibrations due to the mirror movement (commonly known as 'mirror slap'). Accordingly, in the new test I used a small sandbag draped over the body to dampen camera movement. In the interim, I had also settled on a new standardised testing methodology where all of my images are all being assessed against the same target at the same magnification. As a result, in future all lenses tested will be able to be tested against each other directly. As a part of these changes my selection of film has changed to Fuji Astia 100F. Astia is a very fine grained film (RMS Granularity 7) and can resolve up to 140 lpmm at contrast of 1000:1 to 60 lpmm at contrast of 1.6:1. In this respect its resolving power is similar to Reala, just with finer grain. Slides have been scanned at 5400 dpi with no ICE or GEM applied. The individual scans have had levels adjustment and moderate unsharp masking applied to the full-size scans (200, 0.3, 0). It is noted that each of these crops measures approximately 0.9mm on the original negative, which on an 8 x 10 inch enlargement would equate to approximately a third of an inch square, or approximately 7mm square. The full size image from which the crops were taken. 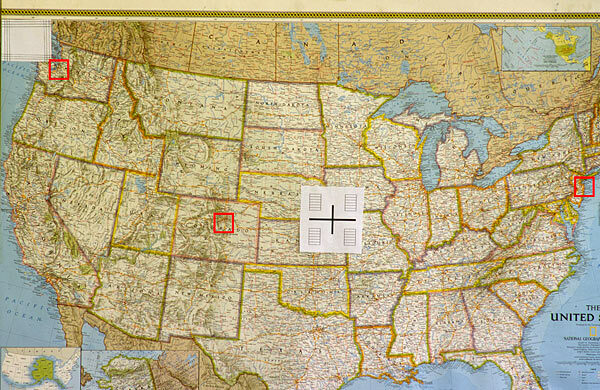 Cropped areas are indicated by the red squares, and each represents approximately 1mm square on the final negative. Performance at f/2.8 is consistent across the frame. Sharpness is affected slightly by slightly lower contrast than at other apertures, but overall resolution is very good for a fast lens wide open. There is some evidence of falloff and chromatic abberation, which will be reviewed further in page 2 of this review. Overall, I consider thisto be very good performance wide open, particularly given the consistency of resolution to the corners. Performance at f/4 is shows significantly improved resolution at both the centre and at the extremes of the frame. Contrast is noticably improved. Chromatic abberation is still apparent, but minimal. Unlike my first test, performance at f/5.6 shows better results than those achieved at the wider apertures, demonstrating that the original test was affected by camera shake. Both contrast and resolution have improved, albeit chromatic abberation remains apparent. Performance at f/8 shows outstanding resolution, albeit still with minor chromatic abberation. Based upon the results above we can see that the 200mm f/2.8 has great resolution at wider apertures, making it an outstanding lens for low light photography where extra reach is required. This improves as the lens is stopped down, and is exceptional at f/5.6 and 5/8. The sharpness of this lens wide open means that in general use the photographer can maintain higher shutter speeds for reduced camera shake. However, resolution is only one aspect of performance, let's see how the 200mm f/2.8 stacks up in other areas. For that analysis, click on the link below to page two of this review.